« Slow Swimming: Is it Age . . . or Activity? Should we train more intensively in middle age? My last post Slow Swimming: Is it age . . . or activity? brought a larger than usual response. One seemed particularly worthy of becoming the subject of a followup post. Glenn Gilchrist wrote: I think the common wisdom on degradation of performance due to aging is dead wrong. Where does this 2% decline after 60 come from? Could there be other factors? Maybe as athletes age they just don’t try as hard. Maybe winning, and the work that goes into it, just isn’t that appealing anymore. Maybe being just a little more sore than at 40 turns the effort down a notch. Finally, there is the power of belief. If you believe you will get slower — and most people do — you will get slower. I am 61 and only started training at age 54. I learned to swim using TI and became a triathlete. After two years I stopped competing, but now am at it again. I train 2-3 hours per day, 6 days per week. My interval work gets my HR over 90%. I have never been in better shape in my life. I did a half IM 5 years ago and was fast enough to win my age group, yet I am now faster then I was then. I have no athletic genes or history. But I do the work, every day. And every day I am more and more amazed at just what our bodies are capable of. I hope Glenn is right and common wisdom is wrong. Besides the performance studies, physiological studies have suggested an accelerating decline in certain physical capacities somewhere around age 60. Glenn is among the outliers – those who refuse to believe studies like those should determine what we think is possible. Since the great majority of those over 60 tend to be less active than they were at 30, any sampling of that population will paint a portrait of ‘normal’ aging influenced more by human inclination than human biology. As I’ve noted, my decision to train more intensively has two motivations: One, to discover how much my marked loss of speed is due to aging and how much to several years of simply not trying to swim fast. Two, my growing Addiction to Arduous Experience – to pursue activities that take me out of my comfort zone. Training less intensively – and more extensively – isn’t something I’ve only done as I aged. It’s been my preference since I first became a serious athlete at age 18. I learned early on that I was more competitive in longer, than shorter, races. Thus I always preferred what’s called “steady state” training, where you focus on maintaining a constant pace for a very long time. It’s not just physiological. It’s a skill — both maximizing efficiency and developing a keen sense of pace and effort. Committed practice over many years brought Mastery of Pacing. Disciplines in which we’ve achieved Mastery are highly satisfying so we tend to do more of them and seek Continuous Improvement. Physiologically speaking, in steady-state, your HR stays in a relatively narrow range for a relatively extended period. After doing that for 40 years, it’s much harder to, essentially, put my heart on a roller-coaster. A short bout of very high HR training, then a recovery period — well below your normal aerobic range. I’m making that choice precisely because I have so little experience with it. Thus the potential to grow new neurons – both cognitive and motor – while also keeping the mitochondria in my cells higher functioning and more ‘youthful,’ is probably greater than with steady-state. If my experience also suggests the aging process responds positively to intensive training, who could fail to be encouraged? Well Terry I just disproved the aging theory in my case at the St. George Marathon where I achieved a 20 year pr there at 67. Ran a 3:15 which I had to go back 20 years to find. Two scenarios here. Maybe I overcome aging but probably I never really reached my potential in earlier years. My heart rate maximum is still 180 but I could achieve some over 200 in my earlier years. My chi running style has definitely speed-ed me up. So efficiency, more speed work, pay off. For me I’m charging on, giving it all I have for as long as I can. At 120 pounds (my high school weight) I don’t have to much to carry around. That is another myth that we “must” weigh more as we age, it is a lie. You can get fit, lose weight at any age. Charge on my man! At 62 I am actually improving my swim technique! I recently swam 25 yards with 17 strokes and one breath!!! Usually 22-23 strokes. I have been doing tris since 1987. Of course by knees are shot so I am slower on the bike and run (having run 42 years and 17 marathons and 2 ironmans). So I can’t go long anymore, but I do short and qualified last year for Worlds! I have found that I can tolerate very high intensity activity at 48 and have been able to keep my body fat down and maintain the same level of performance I had when I was younger by being mindful. I had a serious rotator cuff injury 15 months ago so I had to learn what worked and what didn’t for my body. I have gotten wiser with age and that is why I can still be fast for me at 48. I listen to the cues my body gives me instead of ignoring them and I train according to my goals in competition (not just putting in miles, but doing fast swimming so I can be a fast swimmer). So many people think they will get fast by doing a bunch of yards, but I can swim much faster with regular 2,000 yard good-quality sessions than workouts of 4,000 “junk” yards. Susan I have a condition that seems to be age-related and has eluded many efforts to solve it. My calves cramp from doing pushoffs. In 2001, while training for my first Manhattan Island Marathon, I could swim for 3 hours at a stretch in a 25-yd pool (about 400 pushoffs) with no problem. Since then my ‘pushoff tolerance’ has steadily shrunk. Five years ago I could swim 90 min; two years ago 75 min. Now I’m fortunate if I can make 60 min before ‘terminal cramping’ makes it impossible to continue. Yet my aspirations and goals remain as high – if not higher – than when I could practice two or three times as long. I’ve come to conclude this circumstance can be fortuitous, rather than inconvenient. 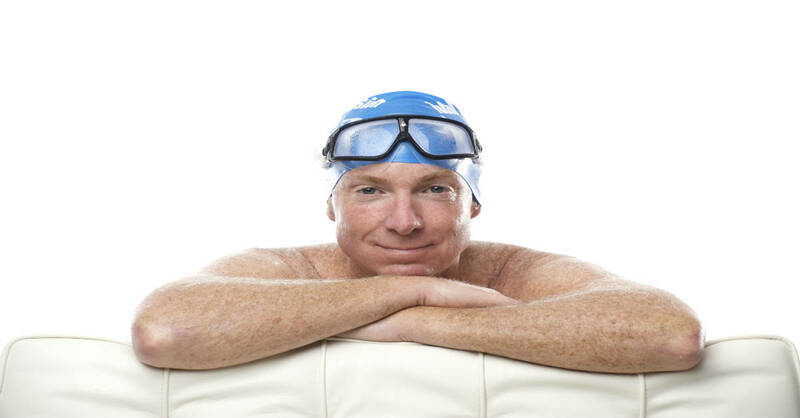 Knowing as I start that I might only get 50 minutes – sometimes less than 3000 yds – I’ve been keenly focused on making every lap, every stroke, count. Thus I plan my sets with rigorous care. I never do a single length for which I’m not crystal clear on the direct benefit to my racing goals. I’ve discovered the shorter, more focused practice stimulates steadier improvement than longer practices with even a slightly-diffuse focus. I feel sharper, faster, more energized. And that energized feeling persists long after I exit the pool. I’ve since applied that lesson to my other physical activities as well. I’m fortunate to have good x-c skiing 10 min from my house. Where I used to feel a ski wasn’t worthwhile unless I got in 90 min or more, I now ski for 40 to 50 min. As a result my form, relaxation and ‘easy speed’ are all improving more rapidly than ever before. I used to visit the gym for hour-long sessions. Now I have a few simple exercise tools at home which combined with creative bodyweight exercise, allow me to feel a higher level of strength and suppleness achieved in more-regular sessions of about 25 min. Congratulations. One suggestion: Rather than see how far you can go on one breath, work on mastering breathing technique so seamless you can breathe on every stroke cycle without compromising your form. Leo Your marathon performance, and optimism, remain an inspiration for me and many. I’m striving to return to my weight from my mid-20s (178 lbs), but my HS weight (130) is probably unrealistic and unhealthy for a 6-foot swimmer. I could see lightness being really valuable for a marathon runner though. I’m losing weight via a more plant-based diet, heavy on greens like collards, mustard, chard, kale and spinach. I enjoy eating them and this diet is as healthy as they come. I think the result of eating better, and losing 30 yrs of belly fat will likely be a healthier cholesterol and blood pressure. But my desire to maximize swimming speed is also a helpful motivation booster. I think I’ve read a mention of this before, but what is the “condition” that leads to your calves cramping? and what treatments have you tried? I have a similarly low tolerance for push-offs; I think mine may be related to back troubles. I would much rather do my swimming in a river or lake somewhere to avoid the cramps (no push-offs=no cramps) but for convenience with my daily schedule I end up doing most of my training in a 25 m pool. I’m hoping to find a way to improve it with age as I would like to enjoy many more years of swimming. Susan I never use fins in practice. The only tool I ever use is a tempo trainer. I have arthritic narrowing in my lower spine. That may have something to do with the cramping tendency. I’m doing a lot of core stability exercise to improve it. I am a 50 yr. old novice swimmer but took one of your courses and have been enjoying tris for the past 4 summers. Because I don’t get as much open water practice as I’d like to, a month before a race, I stop kicking off the wall and just do a one arm turn as if I am rounding a buoy in a race. It does throw off my form a bit, but I just think of it as simulating race conditions where I might get jostled and I practice refocusing. It may not be the best practice for form but I wondered if anyone ever perfected this technique (because of calf injuries) to be more smooth in a tight setting of a lane or is it just bad for one’s form? Cheryl Some coaches occasionally take all the lanes out of a pool and have their swimmers practice as if in open water, sometimes even putting small turn buoys in. I could see putting buoys near the four corners and swimming a kind of rectangle course.